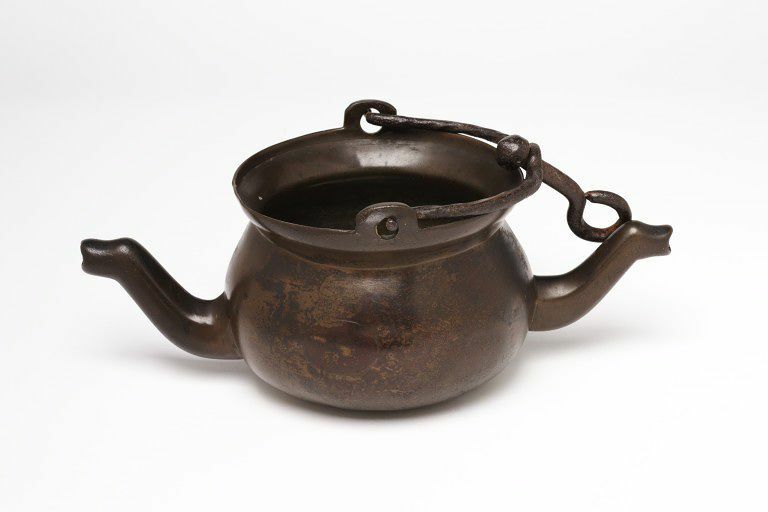 The lavabo or hanging laver gradually displaced the ewer in many households as a means of dispensing water for washing hands. The basic shape of the body was usually that of a flattened sphere. 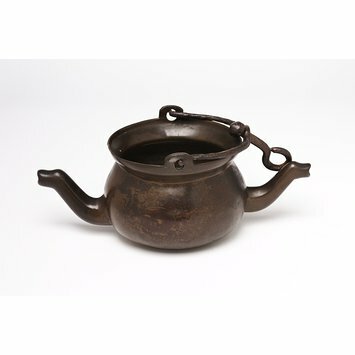 The rim, the spouts and the junctions of the loop handle with the body were opportunities for the craftsman to demonstrate his artistic skills. It is not uncommon to find a human bust concealing the join. This example lacks such decoration and would have been made for a less wealthy household. Occasionally lavabos were made with a single spout. This example is of the more common type, with two spouts placed between the supports for the handle. The end of each spout vaguely recalls the head of a beast. This is a pale imitation of the spouts of the more elaborate lavers, which are often shaped as the head and open jaws of some fabulous creature. Circular, with two spouts, spreading lip with two sockets for swing handle, with pivoted loop.